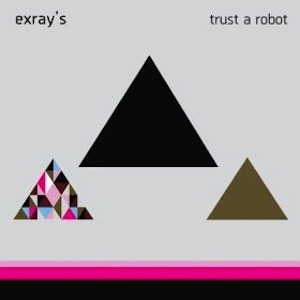 On their sophomore album Exray’s invite you on an escapist adventure. With a dystopian view on modern society Trust A Robot takes us on a journey into space. Trust A Robot is a lo-fi pop carousel that throws around thoughts and ideas concerning space travel and life in the universe. With earth seemingly no place to live, a robot is assigned to find another home for us earthlings. If the theme itself seems to cause a bit of light-headedness, rest assured the musical explorations are far less perplexing. Despite their gloomy outlook on life the San Francisco based duo, consisting of Jon Bernson and Michael Falsetto-Mapp, offer a rather whimsical kind of bedroom electronica. The atmosphere is built on ambient guitars coupled with mild percussion and punctuated by the occasional synthesizer. The minimalist approach leaves enough room to help Bernson conduct his mind travels in an unruffled setting. The result is a pop-noir record that both allures and bewilders.